From the Stirling Ranges in Western Australia, Darwinia meeboldii is one species that likes a little protection from the heat of the afternoon sun. The flower is bell shaped like most of the species, however opens up with distinctly pink tips, a natural pendulous habit makes the flower5s look a little like bells. This is more of a plant for the enthusiast as it has proved difficult in cultivation. The combination of good drainage, good air flow and protection from the heat of the afternoon are our best guide. Some good specimens can be found in gardens around Melbourne, so it is possible to grow it successfully. 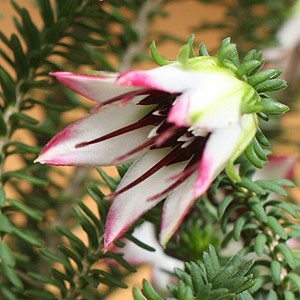 In the garden, use this a feature plant, it will attract birds and bees when in flowers.It is also possible to grow Darwinia meeboldii in a container in a sunny courtyard. A yearly application of a low phosphate native plant fertiliser will assist with growth. Like many of the Darwinia macrostegia, expect to get 4 – 5 year of wonderful flowers before needing to replace the plant. Usually from seed, softwood cuttings are possible and grafted forms are increasingly popular as they are hardier outside of the natural climate zone. Position – Full Sun with afternoon shade in the heat of summer. Height – To around 3 metres, often less than half this height. Spread – To around 1.5 metre. Frosts – Will tolerate light frosts only.